My project to map the abandoned railroad corridors of the world began in my home state of Illinois, and as such, I thought it would nice to revisit the area and discuss some of the many railroad bridges in the state that no longer serve any traffic, including those lost to history. According to Bridgehunter.com, there are over 1,400 bridges that were built in Illinois that are no longer standing. And even bridges that still exist, there are many hundreds that no longer serve any traffic whatsoever, including pedestrians. Today, we're going to look at just 10 of these, which barely scratches the surface of how many lost bridges there are in this state, and indeed the rest of the country, but if there's enough interest, this can certainly be revisited in future blogs. Any other bridges you have photos or information on, please share in the comments! The Mississippi River is a dominant geographic feature when it comes to railroads. The sheer size of the river makes it difficult to cross for freight traffic, and thus it is uncommon for railroads to abandon bridges that were built over the river. 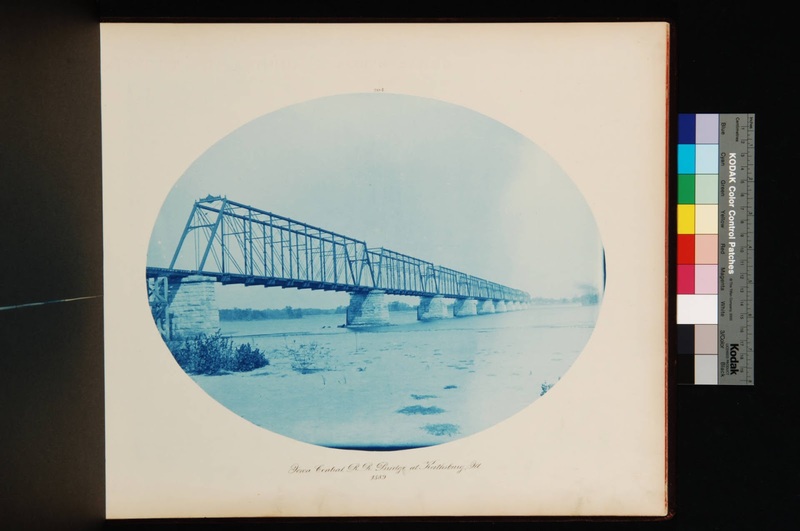 Nonetheless, there exist numerous examples of bridges that were indeed abandoned, including this bridge completed in 1894 for the Chicago Burlington & Quincy Railroad. This bridge connected the busy railroad town of Alton, IL with a railroad junction at West Alton, MO across the Mississippi. The bridge was demolished by the CB&Q's successor, the Burlington Northern, in 1988, but not before extensive photography and documentation took place by the Historic American Engineering Record, available via the Library of Congress. Another lost Chicago Burlington & Quincy bridge existed in Peru, IL. This one has a more interesting history, as it was originally built in 1890, but did not include a movable span, which meant that steamships could not traverse the river. This was corrected in 1913, but the original bridge was replaced in its entirety in 1932 with a vertical lift span, pictured above. A nearby bridge built for the Illinois Central Railroad is still in service over the river. This time, the railroad was abandoned in the late 1970's, and the bridge didn't last much longer, being demolished on June 17th, 1980. This is one of the unique uses for an abandoned bridge, as this one is still standing, but is used for signals for the railroad line it goes over! The Metropolitan West Side Elevated Railroad began constructing elevated lines in the City of Chicago. This particular stretch was for the Logan Park branch, a line about 1.5 miles long, between what is now the CTA Green Line just west of the Ashland Station, and what is now the CTA Blue line just west of the Division Station. According to Forgotten Chicago, this line was used until 1951, with the Logan Square Branch being demolished in 1964. This bridge was the only remnant saved, as it was purchased by the Chicago & Northwestern to become a signal bridge, which it remains today. My photo, taken on a mid-February day with the sun breaking despite lingering snow showers. We stay in Chicago for the next bridge on our list. 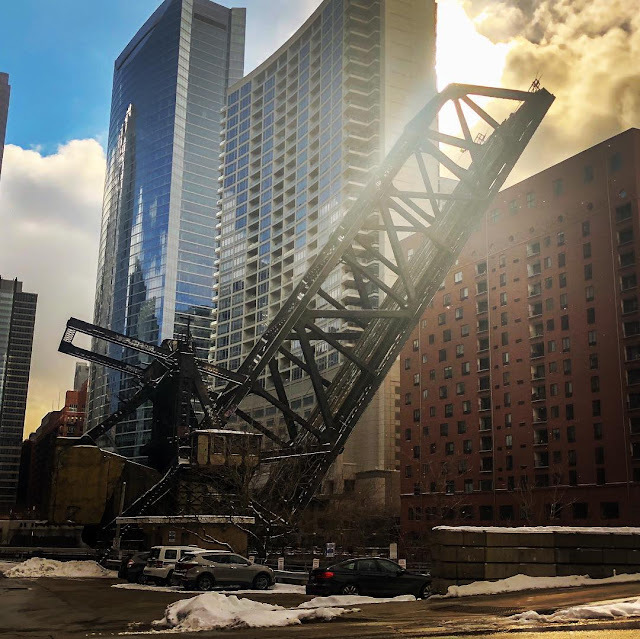 I'm going to save myself numerous comments by stating that technically, the Kinzie St Railroad Bridge is still in service, as Union Pacific lowers the bridge and drives a hi-rail truck over it once a year. However, the line east of the Chicago River has not been used since 2000, and will not be used any time soon. It's an icon of the Chicago River, and that's why I'm including it on this list. The first bridge in this area was built in 1848 for the Galena & Chicago Union Railroad, Chicago's first railroad of what would become hundreds. A swing bridge replaced the original in 1879, and this too was replaced by the current bridge in 1907. The bridge was used for industrial operations as far east as Navy Pier, but only served commuters for a few years, as the Chicago & North Western Station (now known as Ogilvie) was completed in 1911. It served the Chicago Sun-Times until 2000, when it put permanently out-of-service. While the Kinzie St Bridge is an icon, not every abandoned bridge can hold that status. In fact, the vast majority of abandoned bridges may not seem to be interesting at first glance, but each has a story. Here, the story is of the significant challenges interurban railways faced in the early 20th century. As you can see, the bridge is still standing, but you could hardly tell it was ever intended to be a railroad bridge from its condition. The bridge was built in 1909 for the Bloomington Pontiac & Joliet Interurban Railway, intended to connect its namesake cities. Ultimately, like many interurbans, it was dreamed to be more than it ever became, as the BP&J only ran between Dwight & Pontiac. The line would've directly paralleled the much larger Chicago & Alton Railroad, which still today has passenger service via Amtrak. By 1925, with the construction of Route 66, it was clear an interurban could not survive, and the railroad was abandoned. This through truss bridge, located in rural Logan County, Illinois served a Chicago & Alton Railroad line between Peoria and Springfield. 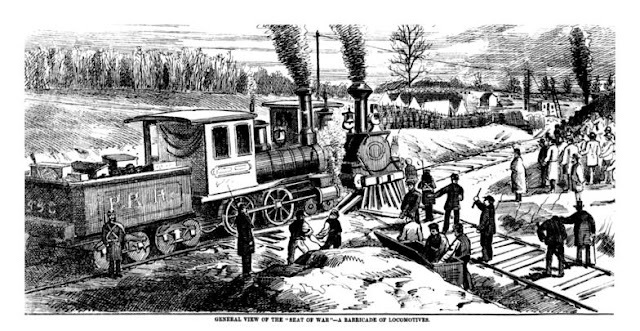 It later became part of the GM&O, and the Illinois Central later still after their merger. It was abandoned in the 1980's and removed before 1998 according to satellite imagery. 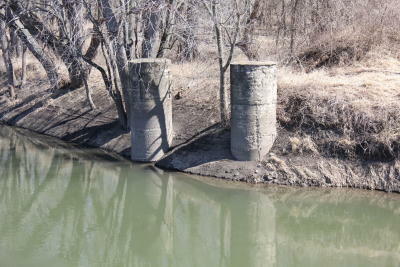 Here's what's left of another interurban railway bridge, this one east of Freeport, IL on the Pecatonica River. Like the Rooks Creek Bridge, this also paralleled another railroad; in this case the Chicago & Northwestern between Rockford and Freeport. It too is abandoned, and it too had another bridge over the Pecatonica River, which is still standing and part of the Pecatonica Prairie Trail. But this bridge was built in 1904 for the Rockford & Interurban Railway. Unfortunately, no image of the bridge appears to exist on the internet, other than John Marvig's picture of the piers that remain today. 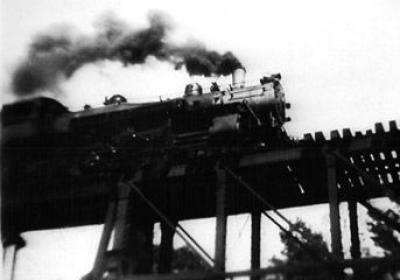 The line remained in service until 1930, with the bridge being demolished two years later. Like the previously mentioned Alton Bridge, the Iowa Central Railroad Bridge is another abandoned bridge over the Mississippi, this time once connecting Keithsburg, IL to Oakville, IA. 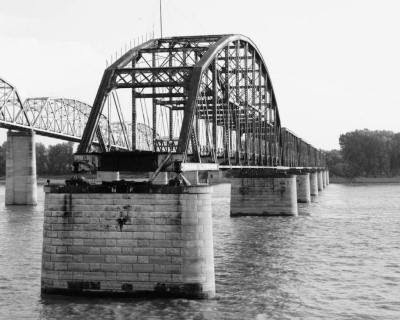 The original bridge, pictured above, was built in 1886, and replaced in 1909 with a lift bridge that partially stands today. The Iowa Central Railroad was purchased by the much larger Minneapolis & St. Louis in 1909, which itself was purchased by the C&NW in 1960. 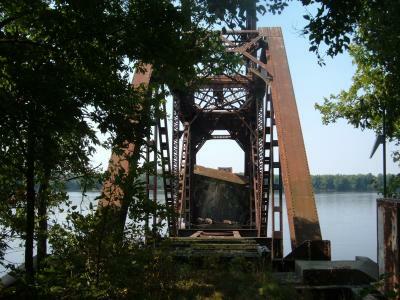 The line was abandoned in 1971, with the lift bridge permanently locked in the upright position. Ten years later, the lift was accidentally destroyed by fireworks, requiring it to be removed by the Army Corps of Engineers, as it was blocking traffic on the Mississippi River. This is probably the most obscure bridge on this list, but it has an interesting history, although most of the bridge is still in ruins. I visited the Iron Works in August of 2018, and noticed this bridge which once connected one side of the Iron Works with another. Dennis DeBruler has done some research on this bridge, indicating that it was of Santa Fe Railway origin, and led into a building on the east side of the tracks. My August 2018 photo of what's left of the bridge. In the background, you can see the still existing tracks which this bridge led over. Another view of the bridge from the Joliet Iron Works/I&M Canal trail. Much like the Polly Bridge in Chicago, this bridge is more notable for what it became after it was abandoned than when it was in service. 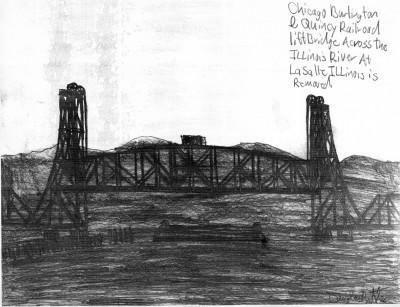 The bridge was built by the Chicago Burlington & Quincy in 1919, for their line between Quincy and Gulf Port, IL. By 1896, the Burlington Northern tore down the structure after the line's abandonment. However, on the land once home to the bridge, the owner of the land built a lodge in the early 2000's, which is what it remains today, and open to the public. 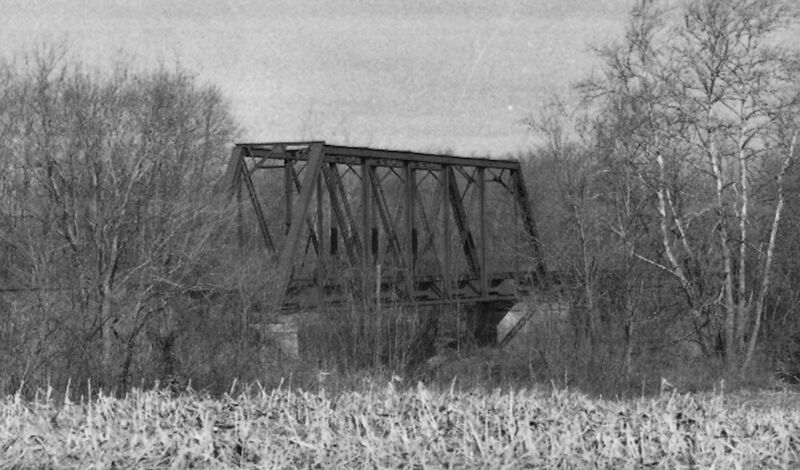 There are many, many abandoned railroad bridges in Illinois, so there remains much to discuss on the matter, nonetheless, I hope you enjoyed today's blog, thanks for reading! My father almost never played video games, but was a big fan of Flight Simulator, as he was also an amateur pilot. While I never cared much for planes (I was more interested in trains and automobiles), I enjoyed the game as well, and loved seeing the birds-eye view of the ground from a Cessna (the commercial jets were far too complicated for a six year old). Nowadays, Google Earth offers the same thing, with much simpler controls. But my favorite thing about the game was that the default airport, and the one we almost always took off from, was Meigs Field in Chicago. Seeing my city in all its 32-bit glory was great, and probably is at least partially responsible for my love of digital mapping. 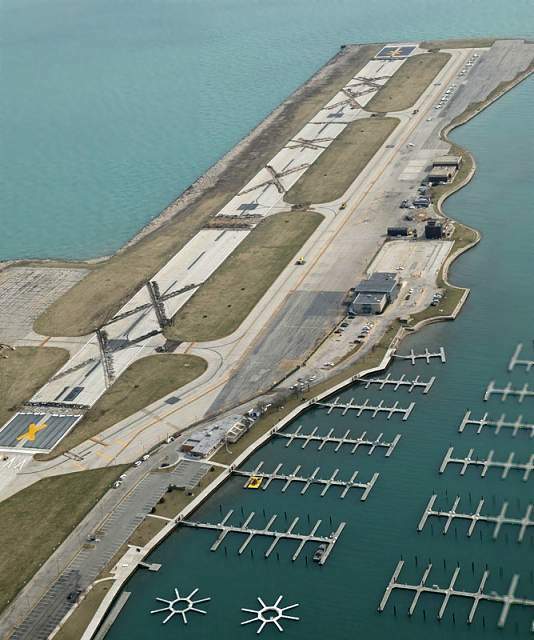 But past 2004, the default airport of Flight Simulator was no longer Meigs Field, for a very simple reason. It no longer existed. Late in the night of March 30, 2003, the airport was razed and large X's were placed on the runways, stranding any flight en-route to the airport, or any airplanes in its hangars. The highly secretive operation kept media, cameras, and other forms of observation away. Why was this done so secretly? Today's blog discusses the life and death of Meigs Field. 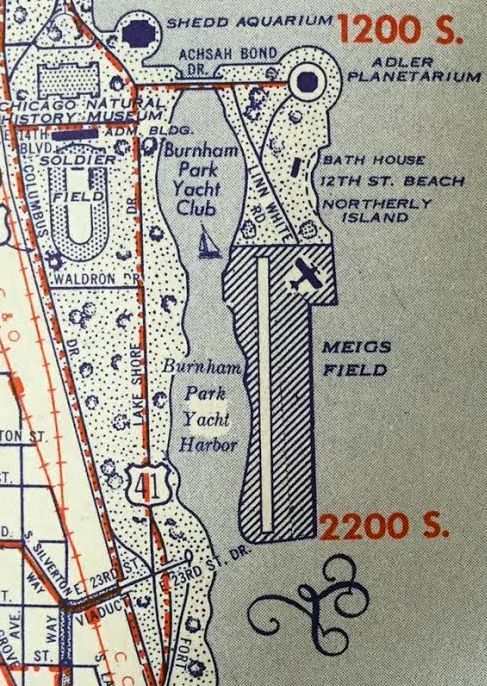 The famous 1916 Burnham & Bennett Master Plan of Chicago proposed a lakefront airport on what would be a still unbuilt island, called Northerly Island. Using land reclamation, Chicago built much of what is today's lakefront in the early to mid-20th century. 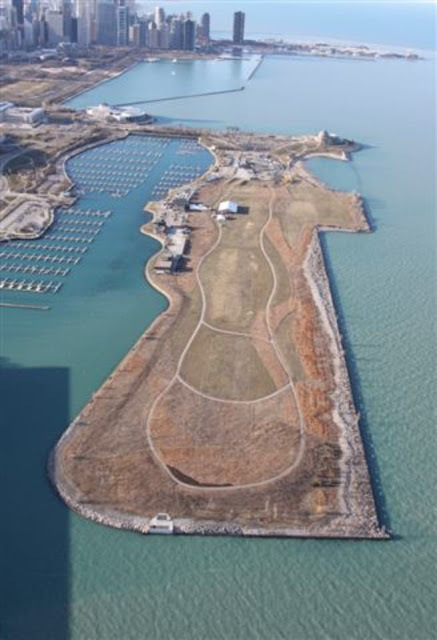 This included Northerly Island, beginning in 1922. Unlike some of Burnham's proposals, such as the Crosstown Expressway, the lakefront airport would become a reality slightly over 30 years later in 1948, being named the Merrill C. Meigs Field in 1950. 1950 Map of Meigs Field. Image: Kevin Walsh via Airfields-Freeman. Meigs' main traffic consisted of small corporate jets, helicopters, medical flights, and commuter flights to regional airports in small cities like Champaign, IL; Carbondale, IL, and South Bend, IN. One could also use Meigs to fly to larger Midwestern cities like Minneapolis/St. Paul and Detroit. United Express and Trans World Express used the airport in the 1990's, supplementing their larger United Airlines and Trans Word Airlines counterparts, respectively. A donated Boeing 727-100 plane used Meigs to land near its current resting place, the Museum of Science and Industry. Hanging above the Museum's most awesome exhibit, its Model Railroad. A local chapter of the Tuskeegee Airmen also used the airport to give local children their first taste of avaition, by offering free rides until the closure of the airport. Both Mayors Richard J. Daley and Jane Byrne had proposed the closing of Meigs field, in 1972 and 1980, respectively. Both proposals were quick to be shot down, mostly as a result of what would've been a loss of FAA funding to the city. In 1989, the city accepted FAA funding in exchange for an agreement to lease the airport until 2009. But that was quickly reneged, as in late 1996 the airport closed for the first time. Governor Jim Edgar negotiated a five year reopening of Meigs, which mayor Richard M. Daley accepted. But the fate of Meigs was sealed only six years later, as Daley ordered the destruction of Meigs on March 30th, 2003, as mentioned earlier. The reason this occurred late in the night was because Daley and the city, did not alert the FAA of the closure, nor did the city notify owners of the airplanes tied down at the airport, of which, sixteen were left stranded. 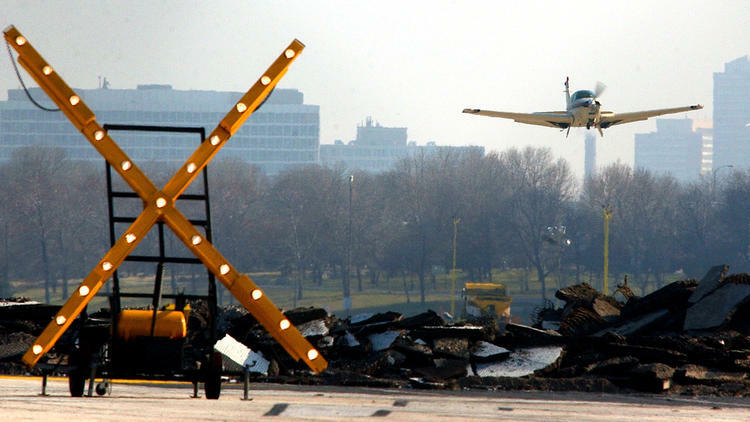 "One of the last planes to leave Meigs Field takes off in 2003" (Image: Phil Velazquez, Chicago Tribune). His lame excuses for subverting the rule of law included that it would be "needlessly contentious" and take years in litigation within the courts, as well as that the city was unsafe in the post-9/11 world having an airport so close to downtown. Ultimately, the city was fined for the move, but was not ordered to reopen Meigs. Today, it is a park, and a pavilion for concerts. I have no issues with former infrastructure that's no longer necessary being turned into public lands and parks, and actively make the case that rail trails help the rail industry, cities, and non-profits alike. But there is a long process that has to occur before it is indeed accepted that a park or trail is the best use of the land, and Daley's midnight closure of Meigs robbed the aviation industry of their day in court to defend Meigs' existence. 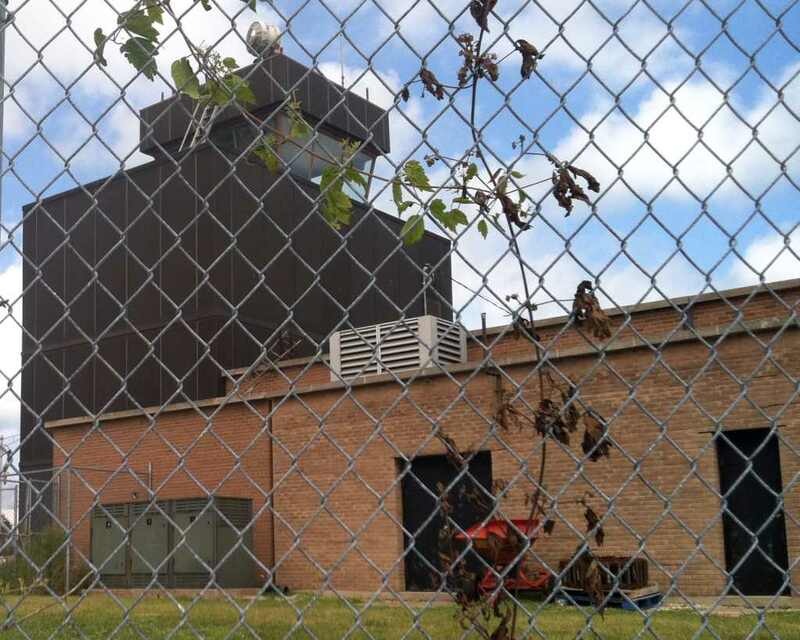 Meigs' former control tower, now a building used by the Chicago Park District. Image: Kevin Raab via Airfields-Freeman. Even today, the overnight closure of a general aviation facility still makes the news, and is still a political talking point, albeit a small one. Candidate Willie Wilson, who came in 4th place among voters for Chicago Mayor, proposed reopening the facility in his political agenda. Coming in fourth, he did not make the April 2nd runoff election. Undeterred, a push for a museum on the former site of Meigs Field is still a dream of some of the aviation community. Only time will tell how successful they will be. It's been three years since I began the insurmountable task of finding all the abandoned railroad corridors of the world. It actually began on 3/29/16, but I have another blog soon to be posted. On one hand, the map, with nearly 400,000 views (undoubtedly more once this post is published), is a complete and massive success. On the other hand, after three years, there's still plenty more to discover! What started as a simple thought while walking on an abandoned railroad corridor one day, "I wonder how many abandoned railroads there are?" took me further than I'd ever thought possible, and spawned this map, this blog, my photography, Facebook page, Twitter, Instagram, and an interest in railroad art and memorabilia. The bridge over US 45 along the Old Plank Rd Trail; among my favorite rail-trails in Chicago. I summarized the background of the map and in last year's update, so this post is going to be mostly about the map's current status and where I intend to go from here. But, let's compare some static images of the map from two years ago to today, just to show progress. Below is what the map looked like in May of 2017. After slightly over a year's work, I had covered the Midwest fairly well, but much of the rest of the US was severely lacking. After working on this nearly everyday, most of the United States is well documented, as is a good chunk of Canada and the United Kingdom, and the rest of the world is starting to fill up as well. 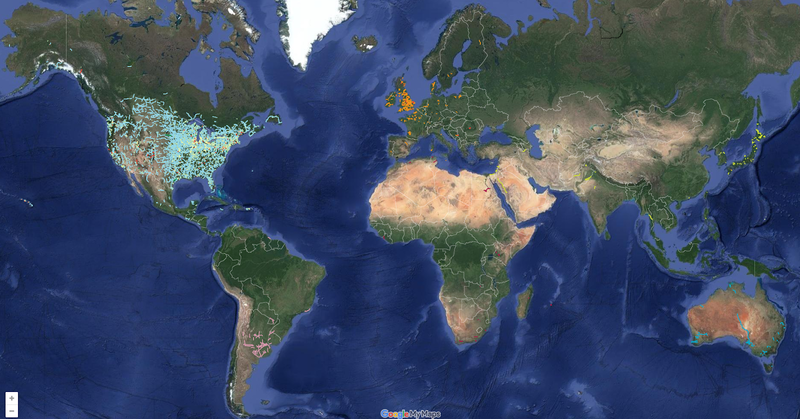 Today, the map is much more full worldwide, but there's still a lot more to go. With all this said, I still get emails every so often regarding corridors in places I thought were complete, so even in my home state of Illinois, I cannot say for certain that I've covered everything, but I can say I've certainly covered almost everything. The map has also grown slightly in scale since last year's update. For one, the map has never differentiated between abandoned rights-of-way and lines that are simply out of service. 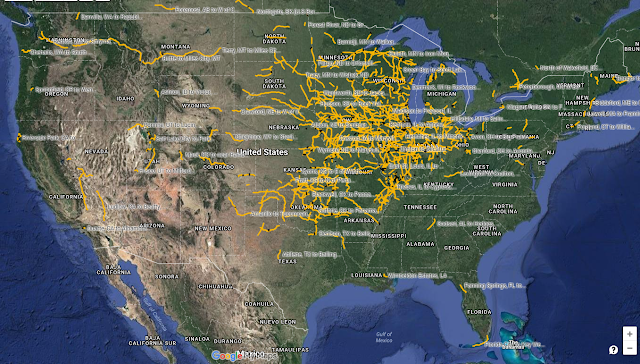 As such, I renamed it from "Abandoned Railroad Rights of Way" to simply "Abandoned & Out of Service Railroad Lines". The point of the map has always been to show where railroads no longer run, whether it be through abandonment, rail banking, or simply disuse, but there are three layers which go somewhat beyond that scale. The first is the unbuilt railroads layer, which currently has 47 railroad proposals, some of which were partially constructed, but which never ran a revenue train along the route. These often have little to no information on them, and their existence is often only referenced in railroad manuals from the late 18th and early 19th century, but many also had some sort of construction associated with them, such as the Decatur & State Line Railway. In black, they are the hardest to spot, just like their real life counterparts. 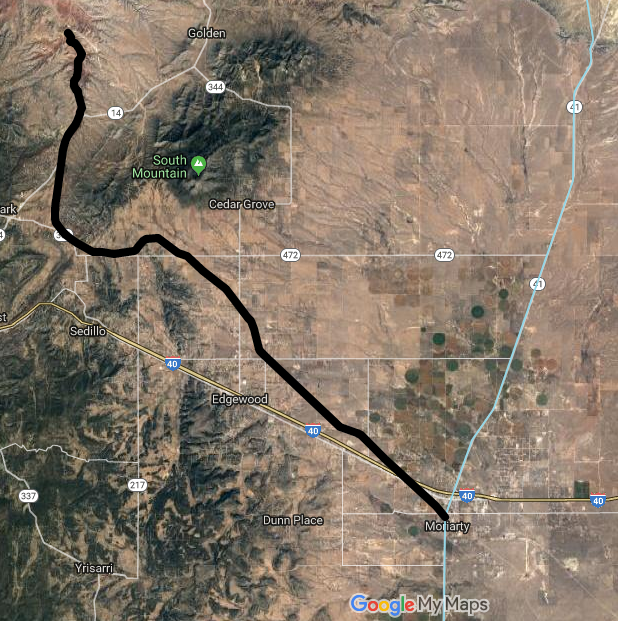 There have been thousands of railroad proposals that never amounted to anything, and as such, I only add them to the map if their proposed right of way is easily traceable, or if they were historic in some way, or if their proposed existence made it onto maps. So far, I've found 47 worldwide. The next is the reactivations layer. When a line goes out of service, or even abandoned, it isn't always the end of rail service, as abandonments are not necessarily a linear function of time. Sometimes if the demand is there, lines can come back into service, such as the old Southern Pacific line between Victoria and Rosenberg, TX, which was rebuilt by Kansas City Southern in 2009. The Green Layer shows reactivated lines saved from abandonment. When an abandoned corridor is taken over by a heritage operator, I don't consider it in revenue service, instead I add the line to the Tourist Trains, Amusement Park and Heritage Railway layer, in red. My rationale for the difference is that these are now museums and public attractions, as opposed to simply a business. In addition, two maps have spun off from this project; my Ghost Towns Map (which is much more a work in progress), and the Railroad Points of Interest Map, which shows the locations of historic railroad points of interests, museums, and other things that may or may not be affiliated with now abandoned railroads. With the hundreds of thousands of miles of abandoned railroad corridors in the world, it's no surprise that some of the most amazing infrastructure humanity has ever built was eventually abandoned, or re-purposed. And indeed, many bridges, trestles and viaducts have been lost to history, such as the Brushy Creek Viaduct in Alabama. But there are also many which still stand today which serve as reminders of bygone days, the folly of man, or the power of Mother Nature, or some combination thereof. Here are 11 such bridges. Goat Canyon Trestle is the largest standing (for now) wooden trestle in the United States, and in spots is 200 feet off the ground, and 750 feet long. Built in the 1930's, it's actually a lot younger than it looks, since by the 1930's, steel had all but replaced wood as the preferred construction material for bridges. 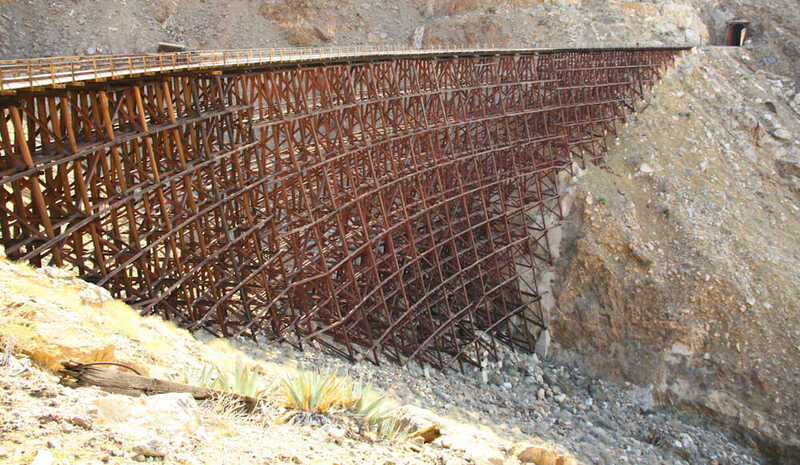 It was made out of wood due to the amazing temperature fluctuations that occur in its harsh desert environment, which would deteriorate a steel structure much quicker than wood. The prevailing winds are also why it was built at a slight 14 degree curve. 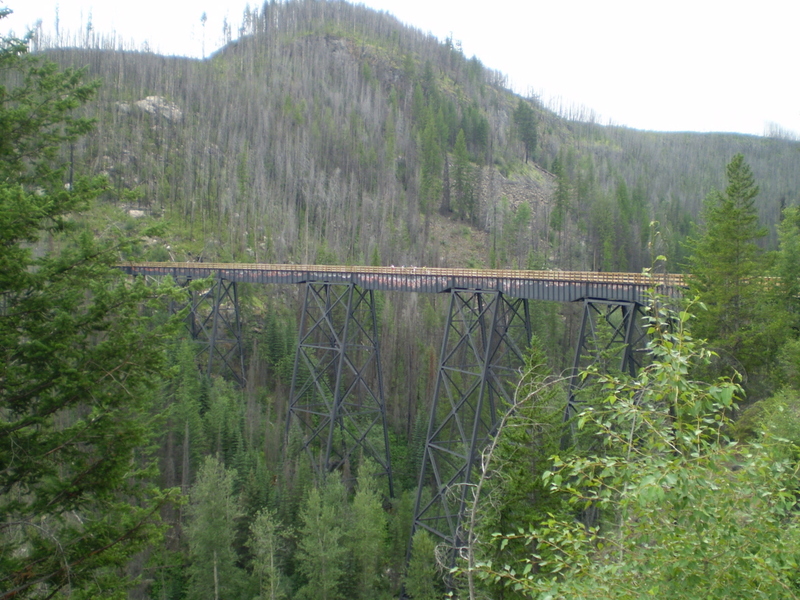 10) Myra Canyon Trestles, between Midway and Penticton, BC, Canada. 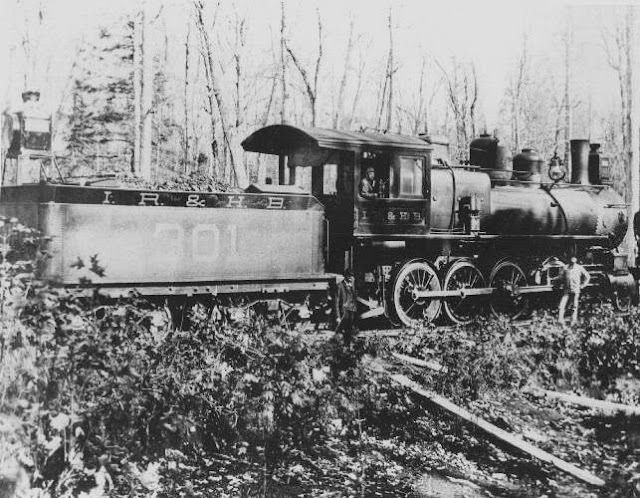 The Kettle Valley Railway was built in the early 20th century, in response to American mining activity in southern British Columbia, and miners using the Northern Pacific Railway south of the border, to transport materials. Thus, like the Transcontinental Canadian Pacific, the Kettle Valley Railway (itself a CP subsidiary) was built to reassert Canadian fiscal control over the region. This was no easy task, going over two mountain ranges, and required some of the most expensive engineering projects in North America to complete. The most amazing of which was the stretch through Myra Canyon, which required 2 tunnels and 18 trestles to navigate a roughly 6 mile stretch. All of the Kettle Valley Railway was abandoned by 1989, but thankfully, many of these trestles still survive along the route today as the Kettle Valley Trail. 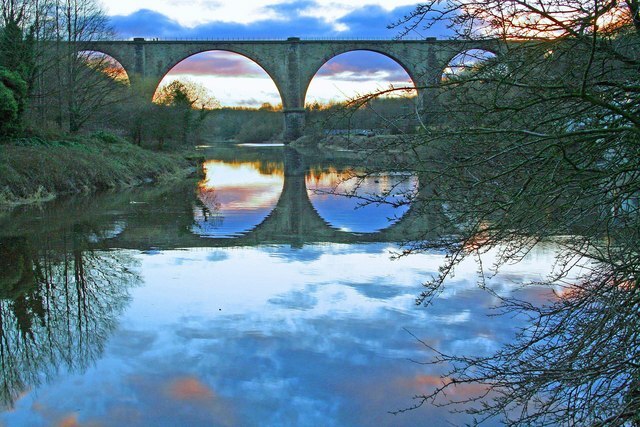 The Victoria Viaduct was built for the Durham Junction Railway, beginning construction in 1836 and completing two years later. It was last used in for rail traffic in 1991. Its design was based on the (much) older, and still standing, Alcántara Bridge in Spain, built early in the 2nd century by the Roman Empire. The viaduct is 120' feet high and over 800 feet long, and at the time of its construction, was one of the largest bridges in Europe, of any variety. The Michigan Central Bridge often gets confused with the nearly adjacent Whirlpool Rapids Bridge, however it no longer carries railroad traffic from Canada into the United States, or vice versa. It was built to replace the Niagara Cantilever Bridge in 1925 for the Michigan Central Railroad, which later became part of the Penn Central Railroad. The Bridge was purchased by Canadian Pacific in 1990, and has been considered for demolition since 2001, although it still stands as of the time of this writing. A large concrete barrier on either side of the bridge prevents people from walking on it, as it does straddle an international border. 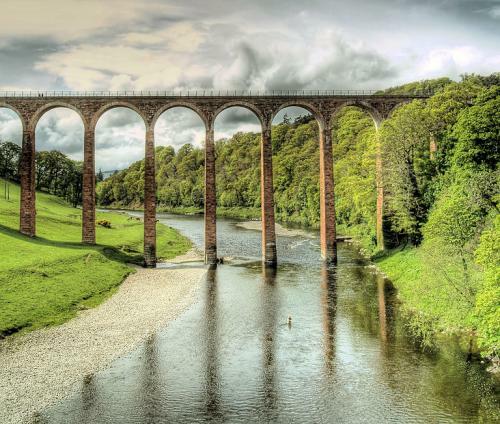 Back across the pond we go to the United Kingdom, and another arch bridge, the Leaderfoot Viaduct was built in 1863 for the Berwickshire Railway, and remained in revenue service until 1965. It was originally scheduled to be demolished in the late 1980's due to its deteriorated condition, but was saved by Historic Scotland in the early 1990's who would renovate the structure for preservation. The original Seven Mile Bridge (and indeed, the entire Overseas Railroad) was built by Henry Flagler in the early 20th century to connect Key West, FL to mainland Florida. I've talked before about how that worked out. 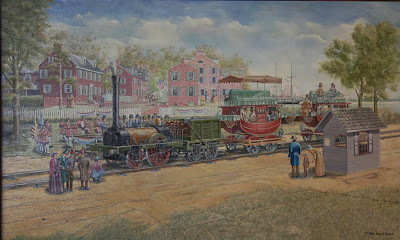 Flagler, the Patriarch of the Florida East Coast Railway, envisioned a line to connect mainland Florida with the Florida Keys, ending at Key West. It wound up costing over $50 Million, as 4,000 men battled three hurricanes in the seven years it took to complete the line. 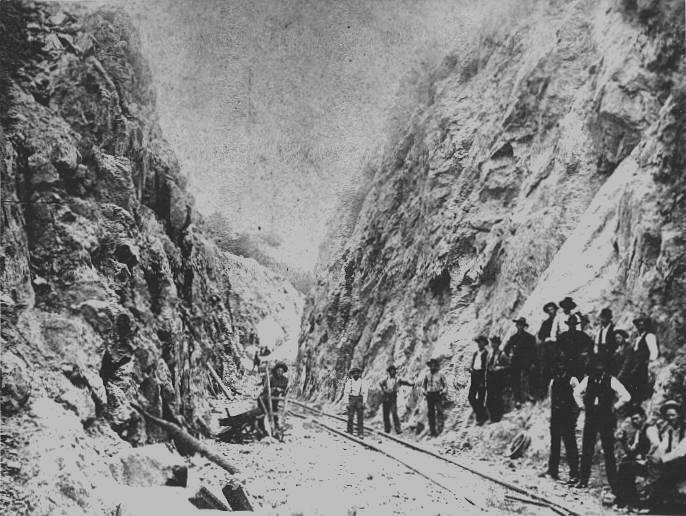 The route was destroyed by the Labor Day Hurricane in 1935. 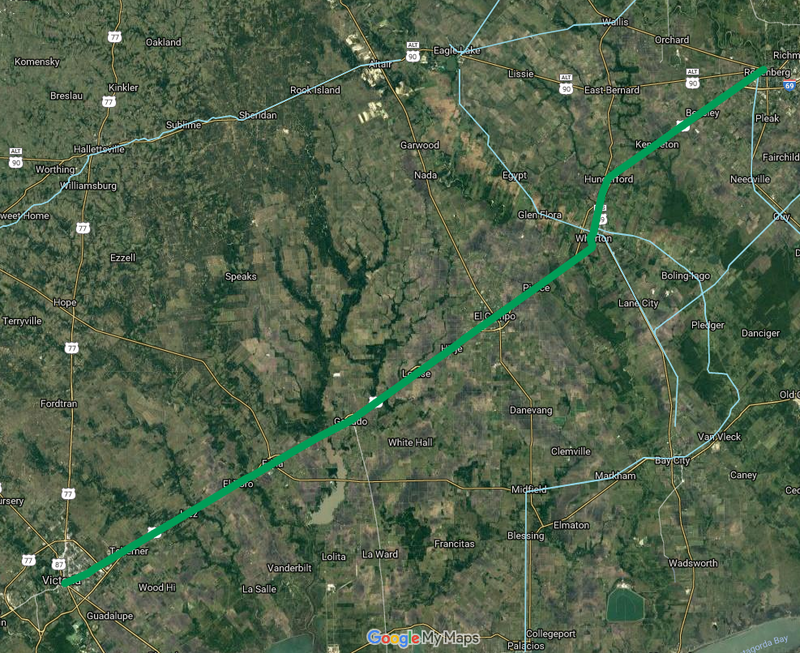 The route would be sold to the US Government to extend US-1 along and near the former right-of-way. 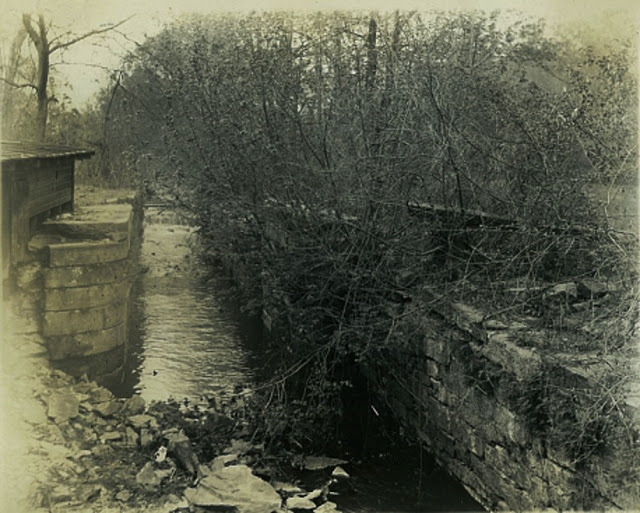 Today, the original bridge still stands, but merely as a fishing bridge, and no thru traffic is possible. Image: Unknown Photographer, Skyscraper City, 2009. A common complaint I hear whenever a new construction project is proposed is why the Phase I planning process is so expensive and takes so long when "nothing is getting done". And the answer to that is because it is in this process that proposals for other alternatives are considered, environmental issues are realized, and so are funding and costs for the entire project. A few million dollars in planning money can save a government hundreds of millions down the road if the project runs out of money or is no longer viable for any number of reasons. This is all very important to know beforehand, so you don't spend millions on the frame for a new bridge without the rest of the route being built. 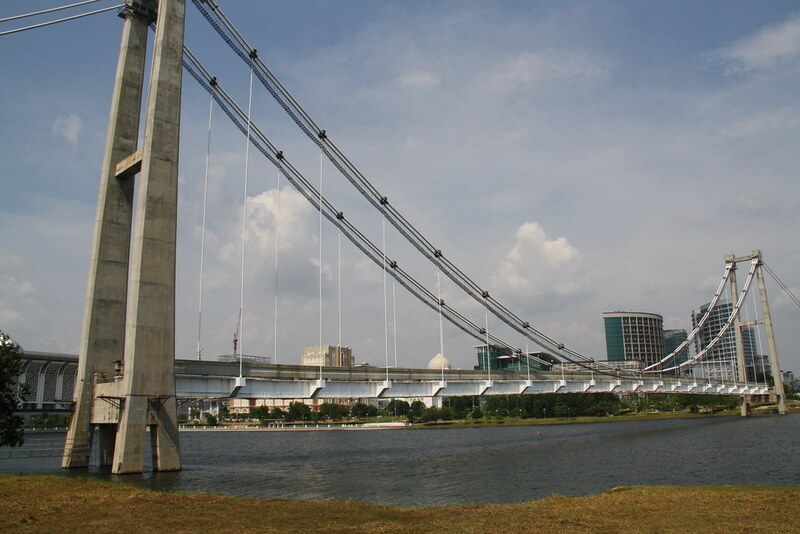 This bridge was built in 2004, but budget constraints forced the cancellation of construction for over a decade, and while construction is still technically being considered (with a completion date of 2021), it is at best 17 years behind schedule, and at worst will be an example of a bridge to nowhere. The Viaduc du Caramel is a French example of an arched viaduct, built in 1910 for the Nice and Littoral Tramway company, and open for service two years later. By 1931, the line was closed. Old Postcard showing the Viaduct in 1912. Sadly, not being able to read French, I do not have a ton more information on this viaduct, however if you can, this site does. The Miles Glacier Bridge, better known as the Million Dollar Bridge, was built in 1909 for the Copper River & Northwestern Railway, one of the most financially successful railroad projects in Alaska, and indeed the United States. Built to connect the Kennecot copper mine near McCarthy, AK with the coast at Cordova, the CR&NW railway was 192 miles long and cost over $25 million in total. 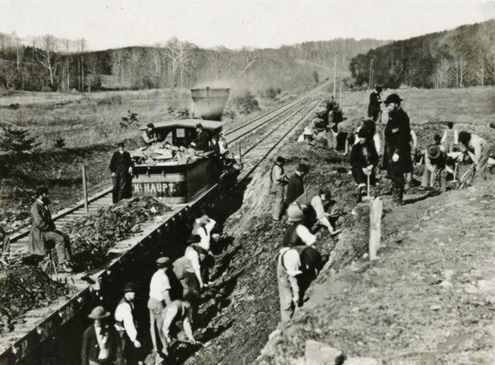 In spite of the cost, the railroad would move over $200 million in copper at a 50 percent profit. The railroad ended service in 1941 when the mine was depleted and no longer profitable. The right-of-way and bridge were donated to the United States to become the McCarthy Hwy. The Good Friday Earthquake of 1964 would partially collapse one span of the bridge, and from there, its fate was in jeopardy. The McCarthy Hwy was rerouted and the bridge was dormant. Nonetheless, it was eventually decided it would be cheaper to repair the bridge than demolish it, or let it deteriorate further, as a collapse would have a significant impact on the migration of salmon in and out of Miles Lake. Repairs were completed in 2005. My 2018 photo of the bridge's underbelly. I've already talked twice about the Kinzua Bridge, having visited it last July, so I'll keep this relatively short. The Kinzua Bridge was the 4th tallest railroad bridge in the United States, and considered the 8th wonder of the world. 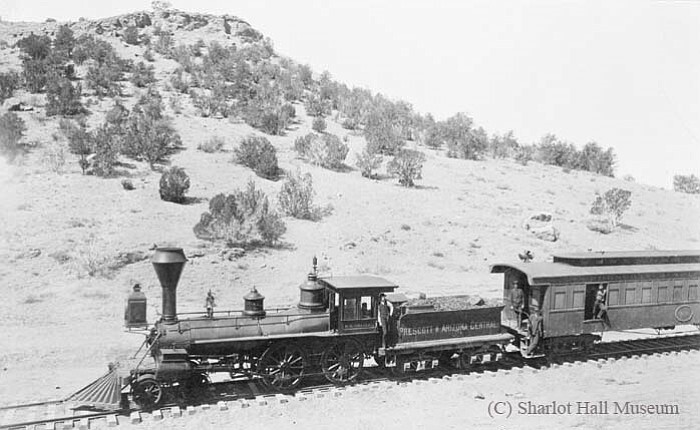 While abandoned for freight traffic relatively early in its life due to its height, which required trains to go no more than 5 mph, it remained in service as a tourist railroad, the Knox & Kane Railroad, until 2002. One year later, before needed repairs could be made on the bridge, half of its structure was destroyed in a tornado. Rather than rebuild it, the State of Pennsylvania decided to leave the bridge in its state, and show the absolute brute force of nature, rebuilding the remaining half as a walkway, not for the faint of heart. Destroyed ruins of the Kinzua from the end of the remaining section. (Andrew Grigg, 2018). Vance Creek Bridge has appeared in numerous abandoned bridge lists and many urbex sites all over the web for one simple reason, it looks terrifying, even from a computer monitor! Built in 1929 for the Simpson Logging Company, it is 347 feet tall and over 400 feet long. Once Simpson logging stopped using the bridge in the 1970's, it became a favorite for trespassers. Proposals have been made to convert the bridge into a trail, however a lack of funding and prohibitively high insurance costs made the project fall through. The structure is still standing, but the railroad ties and approach structure were removed in 2017 in an attempt to stop trespassers from making their way onto the bridge. Nonetheless, that hasn't stopped people from shooting photos and videos. 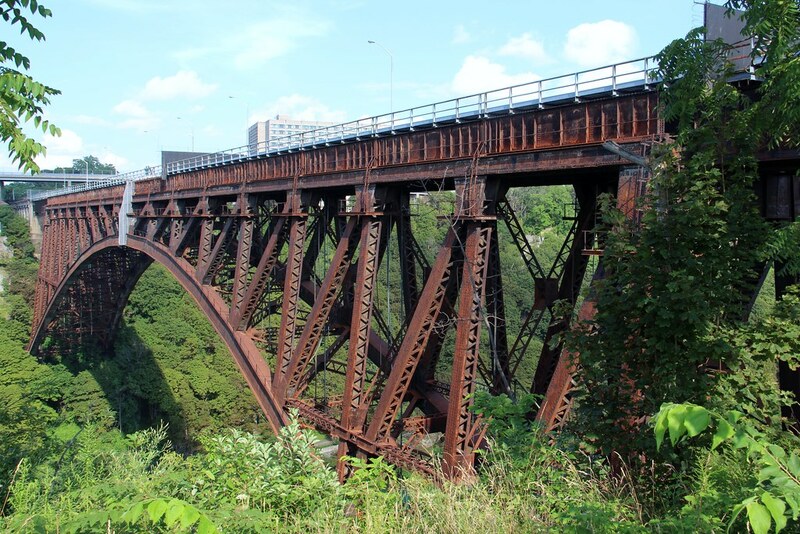 With the huge amount of railroad infrastructure across the world, there are no doubt examples of bridges which are interesting, but didn't make this list for any number of reasons, mainly that I didn't know they exist or didn't come to my mind when making this list. I hope you enjoyed today's blog, and let me know if there's any other bridges you believe should be here in the comments, thanks for reading!